Because of their close relationship to birds, dromaeosaurs like Velociraptor may have had feathers. © Michael Skrepnick. Dromaeosaurs constitute a small clade of theropod dinosaurs which exhibit some highly derived characteristics that they all share, especially modifications of the forelimb allowing for a flexible seizing function (which is thought to have been modified to create the bird "flight stroke"). According to current thinking, birds are hypothesized to have shared a common ancestor with the dromaeosaurs sometime in the Jurassic period; Dromaeosauridae is thus termed the sister group of the clade Aves (which includes all birds). It may even be that the ancestry of birds lies within this group, which would make them dromaeosaurs too, but this is not at all established. The dromaeosaurs were what are popularly known as (especially in Jurassic Park) the "raptors"; a group of fascinating creatures. "Raptor" is not a technical term favored by scientists to describe these animals; there is already a group of birds called the raptors (it includes the eagles and other hunters). The name of the clade, Dromaeosauridae, is favored over "raptors." The dromaeosaurs were small (wolf-sized) to large (up to 30 feet long!) 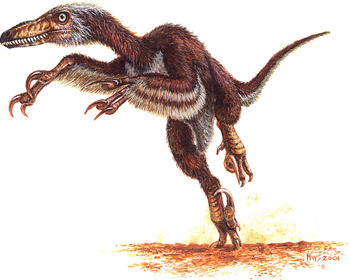 theropods which had specialized features such as a well-developed slashing talon on their second pedal phalanx (toe) (pictured below), a stiffened tail which possibly functioned as a dynamic stabilizer, and large grasping manus (hands). They were well-equipped with claws, muscular toothy jaws, and agile bodies. These dromaeosaurs have been assumed to have been active, fierce predators since their discovery, and have been influential in the revolution in modern paleontologists' views of dinosaur metabolism and bird origins. The skeleton of Velociraptor. © Michael Skrepnick. At top, two Deinonychus approach a herd of tenontosaurs. Above, they attack and bring down their prey. © Michael Skrepnick. Deinonychus antirrhopus: Arguably the most important dinosaur fossil ever discovered, Dr. J.H. Ostrom's (of Yale University) 1969 and 1976 descriptions of Deinonychus ("terrible claw") were a major contributor to the re-evaluation of dinosaur activity levels. Ostrom saw the strikingly specialized adaptations present in Deinonychus and proposed that this was no "sluggish lizard," but an active, agile predator that used all four limbs and its jaws to subdue prey. He also saw similarities between it and modern birds, and has today continued to be a leading proponent for the dromaeosaurian kinship with birds. One of his outstanding students, Dr. R.T. Bakker, went on to become the most ardent supporter of Ostrom's ideas, and has been one of the most controversial figures in paleontology; making great strides to revitalize the study of dinosaurs and stimulating conversation among such researchers. Deinonychus also has been found as fossils in small groups which seem to have been killed while attacking Tenontosaurus tilletti, a larger ornithischian dinosaur. This is considered possible evidence of pack-oriented predatory behavior; leading to speculation that these dinosaurs were fairly intelligent, social animals as well. Deinonychus antirrhopus was about 10 feet (3 m) long and weighed maybe 180 pounds (80 kg); about the size of a jaguar or mountain lion. It has been found in Early Cretaceous deposits in North America. Velociraptor mongoliensis: Velociraptor ("swift seizer") is known from a few well-preserved remains from Late Cretaceous formations from Mongolia; one of which was fossilized in the act of killing Protoceratops andrewsi, a small ceratopsian dinosaur (pictured at the bottom of the theropod exhibit). 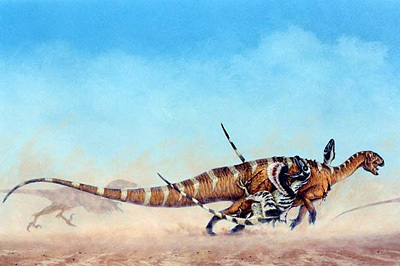 It appears that a freak sandstorm in the Mongolian desert buried the two dinosaurs; the Velociraptor had killed the Protoceratops with its slashing talons, but its forelimb was trapped in the latter's beaked jaws, so it could not escape and was suffocated. One of the most amazing and dramatic fossil finds ever discovered. Contrary to Jurassic Park, Velociraptor was not a large animal; it was about 6 feet (1.8 m) long and weighed maybe 100 pounds (45 kg); about the size of a large dog or wolf. Utahraptor kirklandi: However, during the filming of the movie Jurassic Park, fragments of a large dromaeosaur skeleton were found in Utah. A study proclaimed that the giant raptor from the movie had been found; this animal seemed to be the perfect size for such a creature. Giant dromaeosaurs have been recently found in Argentina, Japan, and elsewhere in Asia, so we know that there were probably several types of dromaeosaurs about the size of the Jurassic Park villains, and even larger! The foot of Deinonychus compared with that of a modern pigeon (not to scale). © Michael Skrepnick. The "killing claw" of dromaeosaurs is an incredible structure useful for just that: killing. It was normally held off of the ground during locomotion, but when the muscles of the toe were contracted, the claw swept down quickly. The claw base-to-tip angle maximized the transmission of forces from the leg to the tip of the claw, providing for a powerful slash that may have been able to disembowel prey swiftly. The stiffened tail would have been good to stabilize the body while the grasping arms and jaws held onto the prey for balance. Although there is no conclusive evidence for this, it has been suggested that dromaeosaurs could have performed leaps onto large prey and used all four limbs to rip wounds in them. Truly an example of evolution producing a killing machine. Dromaeosaurs were probably not the fastest of dinosaurs since dromaeosaurs have fairly large femora (thigh bones); ornithomimids probably were fastest (see our dinosaur speeds exhibit for more information), but persuasive evidence in any case is lacking. It has been argued that dromaeosaurs were similar to lions in predatory behavior, preferring ambushes, quick chases using their high maneuverability, and pack tactics. This is speculation of course; we can't really know what dromaeosaurs were like, but we can have loads of fun speculating. New finds of dromaeosaur specimens in the last few years will hopefully tell us more about these strange and exciting dinosaurs. Let's take a look at birds.